Regardless of the amount of money you have, money remains the number one problem in marriages. As a result, money-related issues is also the number one reason for divorce. If you are about to walk down the aisle, it is important to discuss finances with your soon-to-be spouse. However, for those already married, it’s not too late to take some of the following advice. 1. Communication is key. Couples can have similar or very different money perspectives. Before getting married and throughout the marriage, couples should talk openly about their financial goals, spending habits, assets, and liabilities. One of the worst things a spouse can do is keep financial secrets. Be honest with each other and be flexible. 2. Set financial goals. Have short-term and long-term financial goals. Goals should include paying down debt, creating an emergency fund, and saving for retirement. Financial goals should be reviewed, and modified when necessary, on a regular basis. 3. Create a monthly budget. Creating a budget will help keep spending in check and help couples reach their financial goals. Budgeting decisions should be made together. Whether you maintain separate accounts or combine accounts, you have to do what’s best for you as a couple. 4. Extended family and friends. When it comes to borrowing or lending money to family, have a policy beforehand. The best policy…never borrow, never lend. It is important for both spouses to understand and participate in the finances of the household. The more involved both spouses are in the financial decisions and planning, the less bickering there will be over money. There is no one way, but open communication and joint planning can help you achieve long-term financial success and happiness as a couple. 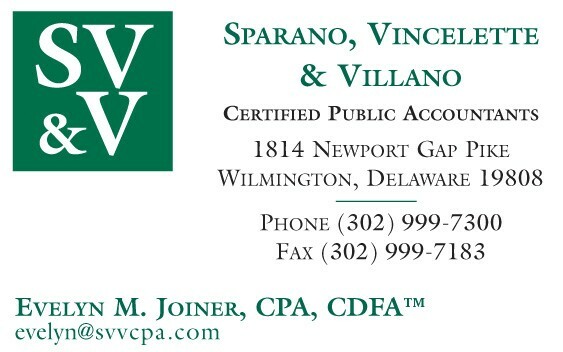 Evelyn M. Joiner, CPA, CDFA™ works for the accounting firm of Sparano, Vincelette & Villano, CPAs in Wilmington, Delaware. 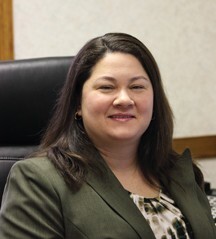 Evelyn started her accounting career in 1999 and holds a Master’s degree in Taxation. Evelyn is the only CDFA™ in Delaware who is also a Certified Public Accountant. You can find Evelyn on LinkedIn at http://lnkd.in/dqjQm3y. Next Story → What Happens When The Caregiver Becomes The Patient?